When Julian wrote his piece last week on Perceptual Blindness, he couldn't have known that at the same time I'd be editing my single Eiffel Tower photo from 2007 and pondering that very concept. Our photo shows the tower in the background viewed at the end of a vista created by an insignificant street lined with a mix of modest hotels and construction work, and was taken with the help of my phone. Of course having to use a phone to take photographs was indirectly the reason we were in Paris this time, as our passports were undoubtedly on their way to Morocco with our camera, leaving us with only two options: we could learn to speak French and just blend in with the crowd for the rest of our days, or we could spend a few days in Paris having deep and meaningful discussions with our Embassy about some replacement paperwork which would allow us to travel across a border once again. The photo isn't all that sharp, and the tower is some distance away, but it's unmistakably the Eiffel Tower, the one that is so instantly recognisable that when they make souvenir keyrings in its image, they don't even have to stamp "PARIS" over the arch. If you leave your Tower keyring carelessly on a boardroom table, the others at the meeting don't have to ask. We visited Paris for the first time in 1982, and like every visitor before or since, made a visit to the Eiffel Tower. I spent hours looking at every detail, at every rhythm and swirl in the structure. 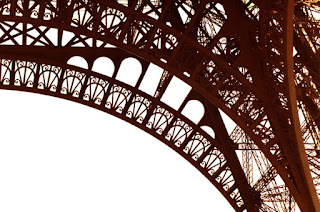 I was amazed to discover that this tower wasn't just a silhouette on the skyline, it was a masterpiece of wrought iron elegantly woven into a piece of fine sculpture. Clearly, I wasn't the first to discover that. I'm sure that Mr Eiffel had a fair idea that it was pretty good, and the World Heritage people had probably noticed a thing or two that set it apart from a few stories of temporary scaffold holding a flag, which was its original purpose. The interesting thing, to me at least, is that I can't recall anyone else being so taken, in fact when ever I happen upon an Eiffel keyring on a board room table, and attempt to share my enthusiasm with its recently returned owner, I'm met with blank stares, as though none of the details exist. "The lights were pretty", they'll say, or "There was a lot of haze and the view wasn't even that great from the top platform." Nothing to describe the wonder. Nothing to indicate they'd even considered the juxtaposition of structure with decoration, the elegance of the curves bisecting the the catenary bracing, finishing with an organic flourish contrived with such skill that it hardly feels contrived at all. The lights were pretty though. Keep trying kiddo, keep trying. You never know when I'll accidentally say "OK, come on then!" The lights were really really pretty- particularly on sunset (around 10pm in summer) when they put sparkley ones on. Ab, you would have loved it!